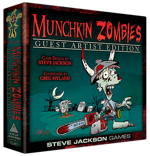 If you're afraid of spelling, cats that never stop smiling, zombies, or counting your murder victims, then October was a month of appealingly spooky, scary releases from Steve Jackson Games! If none of those things scare you, we have to say: Your bravery knows no bounds. At the very least, we thought you'd be afraid of counting your murder victims. Nobody wants to face that number. Read on, if you dare, for a recap of our October releases! I say, good sir, I certainly would not object to a repast consisting primarily of your cerebrum. It's new art for a beloved, undead Munchkin game! In keeping with that spooky October spirit, guest artist Greg Hyland's zombies are graphic; they don't shy away from the blood'n'guts. Just as in the original game, you are a zombie. You equip yourself with An Arm and a Leg, a Bowling Trophy on your head, and Mousetraps on your feet. You might be Fast, Smart, Stealthy, Tough, or Rotting; you could be a Voodoo Zombie, an Atomic Zombie, or a Plague Zombie. So say it with me like a Smart zombie eating an organic farmer: Mmm, artisan cerebrum. 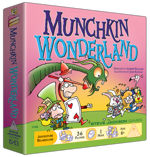 This Munchkin-inspired, Wonderland-themed game is suitable for the whole family, even the youngsters! It's like Munchkin, but with streamlined rules and less backstabbing. You'll fight classic monsters and megalomaniacal queens from Lewis Carroll's Wonderland novels. You'll encounter characters and collect items from the stories. Six Impossible Things Before Breakfast, for example, might help you fight the Red Queen. Meanwhile, that always-smiling terror feline, the Cheshire Cat, might help your opponent fight the Jabberwock! Whoever has the most gold at the end of the game wins! This lighthearted romp is available exclusively on Amazon. Every Flower has its . . . fists. 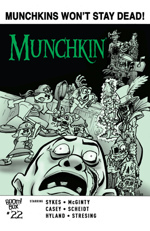 In the latest edition of our Munchkin comic, Flower journeys across wastelands and pleasant suburban lawns in search of her kidnapped kung-fu master. But does he want to be found? Maybe not. Then, a group of survivors hole up in a bowling alley to stay safe from the zombie hordes. But when the zombies get inside, it turns out . . . the survivors are still safe. These zombies have unusual tastes. Find out more when you buy the comic! A is for alphabet! B is for book! 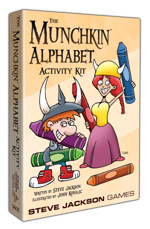 At hobby stores, you can now buy an adult coloring book that contains brand new line drawings from John Kovalic, as well as alphabet verses written by Steve Jackson. 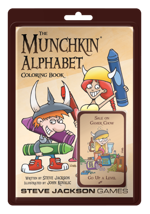 And only at Books-a-Million stores, you can get that coloring book as part of a kit that also contains bookmarks and a Munchkin poster, line drawn and ready-to-color, and the colored pencils to go with it! Whichever option you go for, you'll never again forget that A is for Adventure, and B is for Bar. One! One dead monster! Two! Two dead monsters! During a Munchkin game, a lot of things affect your power level. Gear, one-shots, Go Up A Level cards, and – of course – killing things. This Kill-o-Meter helps you keep track of all that . . . in style. 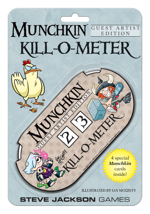 With illustrations from comic artist Ian McGinty, who also drew a recent Munchkin Guest Artist Edition, this Kill-o-Meter packs a visual punch. Visit your friendly local game store or Warehouse 23 (or Amazon for Wonderland) and expand your collection today!